The new venue was a new purpose built site twice the size of the previous Dubai Air Expo around the new Al Maktoum International Airport near the Jebel Ali Seaport. Last week the 645,000 sq m site was home to 1,046 exhibitors, representing 50 countries from both commercial and defence sectors. The biggest group was from the UAE, then Saudi Arabia. Country pavilions from the UK, US, France, Russia, Ukraine, Germany, Turkey, Australia, Canada, the Netherlands and newcomers this year – Sweden and Romania - complemented 150 aircraft out on the static. Aircraft highlights included Qatar Airways’ 787 Dreamliner, the Red Arrows and the Airbus A-400M military transport (media were even invited to take a short flight on it). 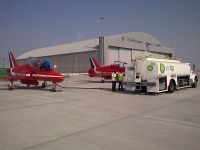 Organisers F&E Aerospace were able to extend the daily flying show to three hours without a break to allow for airline departures and arrivals as the airport is so new. 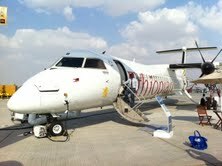 Scheduled flights commenced just late October. Debutante low cost Wizz Air, whose crew stayed at the same hotel as me close to the new airport said its new service to Budapest was progressing well. And so to the eye-popping orders for wide-bodied jets. A total of US$162.6 billion was committed in the opening hours of the show. Boeing heralded a launch customer for its new 777x, an enhanced version of its popular 777 when Etihad Airways signed for 25 (eight 350-seat -8Xs and 17 400-seat -9Xs.) It also ordered 30 787-10s plus options on a further 12, plus one 777 Freighter. CEO James Hogan had not finished yet. “We rarely make air show announcements, but when we do the world takes notice,” he said, returning hours later to sign a firm order for 87 new Airbuses – 40 A350-900s; 10 A320NEOs, 26 A321NEOs and one A330-200Fs. Qatar Airways Chief Akkar Al Baker announced five A330-200Fs cargo aircraft to the orderbook and a whopping commitment (Letter of Intent) for 50 777Xs. 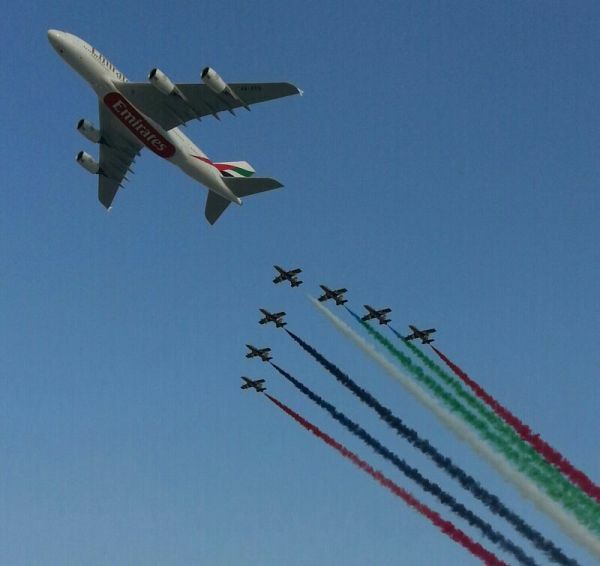 Then Emirates Chairman Sheikh Ahmed bin Saeed Al Maktoum pledged 150 777s (plus 50 options) and in a major boost for the A380 programme confirmed he was taking 50 more, boosting its type to 140. He hadn’t finished yet either, returning to announce 111 737s for low cost subsidiary flydubai. The deal launches the 737MAX into the region with 100 of them to be this type. Follow on orders from Bombardier with new customers Iraqi Airways signing for the C Series (five CS300s, plus 11 options) and Dubai-based Palma Holdings selecting four Q400s which will be leased to existing Q400 customer Ethiopian Airlines, taking its fleet of the type to 17, plus Nok Air of Thailand for two Q400s, propelled the Show’s total orderbook to over US$200 billion. Inevitably now though there is going to be a huge demand for infrastructure; the need to invest in technological and safety enhancements on runway processes to accommodate these large widebody fleets especially. Another important safety issue is aircraft separation and the effect on smaller aircraft when more and more A380s are flying, industry observers noted. When Etihad announced – during its third press conference of the day - it was taking a 33.3% stake in Swiss carrier Darwin Airline and would create a new brand ‘Etihad Regional’ from the first quarter of 2014 a reporter from the Wall Street Journal implored – “you are running us ragged today.” The Darwin deal, which will put the Etihad name in markets where it currently has no presence – including London City Airport where Darwin will commence flights to Dusseldorf from April 2014 is a bold move for the 10- year carrier, the industry’s fastest growing incidentally. Lufthansa, Air France others recently abandoned their ‘Regional’ alliances in favour of Hop (three regional carriers merged together) and Lufthansa is now firmly wedded to GermanWings with its former regional partners no longer flying. Realistically, observers wondered how long will a 50-seat turboprop be the backbone of Darwin’s fleet? Etihad announced here it is giving 10 of its newly ordered A320NEOs to 49% equity partner Air Serbia. The tie-up is good news for Cambridge International Airport where Darwin recently launched four routes, and will add a fifth, Dusseldorf next year too, and a plus personally for its Managing Director Steve Jones who knew Etihad well during his time as general manager of Al Bateen Executive Airport in Abu Dhabi. Business aviation had a strong following at the show. Among the bizjet types out in the static park were Bombardier’s Global 6000, Embraer’s Phenom 300 and Lineage (Arab Wings of Jordan ordered one during the show for delivery next year), the Beechcraft turboprop series and the Nextant 400XTi light jet (the remake of the Beech 400A) making its show debut. Business aviation support companies were well represented too. Gama Aviation, which is running a successful executive handling operation at Sharjah Airport in the UAE and starts work on a new FBO there in January, took a stand, as did Jet Aviation, JetEx, Royal Jet and ExecuJet. 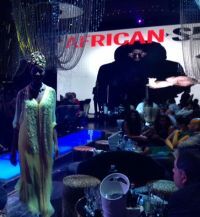 Two of the best parties were held for the sector too – Altitudes Magazine – at the Meydhan Residences, Jumeirah Beach and the launch of African Skies magazine – title of the African Business Aviation Association’s glossy – at the Fairmont’s Cavalli Club, showcasing the best of Moroccan/African fashion with a stunning runway show. A tie up with fine jeweller Chopard featured million dollar jewels showcased in glass. ARINC was at the show to promote its new on board Cabin Connect wifi offering. Here you can log on and access your email and browse the internet from your own pc, smart phone or tablet. Currently trialing with Virgin Atlantic on three Airbus A330s the airline has cleverly introduced it on the Dubai route, along with some great enhancements in the Premium Economy cabin it was noted. (Liz Moscrop, editor of Inflight magazine and I tried it out on our return day flight. Simple to use and good coverage. We paid £12.49 for access– the satellite kicks in about 35,000ft). I will give a brief mention to military aircraft, a major component of the Dubai Show, but only in the context that UK Prime Minister David Cameron flew in for a surprise visit on the Saturday to give a morale boost to the consortium bidding to supply the UAE with a new fighter jet. He didn’t mention the word ‘Typhoon’ but met with Airbus, Airbus Military, the RAF Aerobatic team Red Arrows and BAE before going on to give a rallying talk to companies represented in the UK pavilion.